Reverse bristle rotation for dustpan sweeping available on the 64 and 84 in. 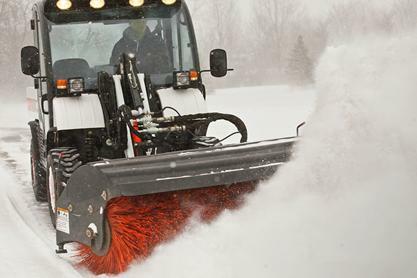 brooms efficiently sweeps leaves, snow, and debris away from corners, curbs, buildings, and obstacles at a lower speed to reduce damage to the cab. Heavy duty bristles have improved wear and better visibility for the operator. The reversible angle brush is available for all new 400-800 series compact track loaders and skid-steers, as well as Bobcat Toolcats with the 7 Pin Attachment Control Kit. The angle broom attachment uses a hydraulically-driven, rotating broom that pushes dirt and other debris away from the machine. The angle broom will continuously sweep debris ahead of the machine or angle the broom to windrow material to the side. To easily sweep debris away from obstacles, the broom can reverse direction and pull toward the machine, leaving behind clean corners and angles.